Oster is one of the those brands that always fall under they radar, but for years they’ve been making quality products without the expensive price tag. The Oster CKSTBRTW20 bread machine makes a 2-pound classic loaf of bread. It has 12 different settings and 3 crust settings. It will make just about anything the other bread machines will make, including specialty items like jam and cake. One cool feature about the Oster CKSTBRTW20 is that it can bake a 2-pound loaf of bread in about 1 hour. This compares to most other machines that bake bread in either 2 or 3 hours. So if you want a machine that bakes bread fast, you can count on this one. The Oster CKSTBRTW20 also has a 13-hour delay timer that pretty much comes standard in today’s bread machines. People seem to want to be able to time when their bread machine starts baking bread. The timer is typically used to start the bread machine in the middle of the night so that it will be ready to enjoy by the morning. There is a LCD display on this unit and a large viewing window to allow the bread to be monitored while baking. This unit will come with a removable baking pan that holds a single kneading blade. Also, it includes an instruction manual, recipe book, measuring spoon, and measuring cup. Although Oster is known for its quality and affordability, it does tend to fall a bit short in the design compartment. You’re not going to get something terribly designed, but when it comes to the appearance it can look a bit bland. So if you are picky about having something aesthetically appealing please keep this in mind. Aesthetics aside, when it came to baking the bread, we tested with the Ultra Fast setting and found that the machine was capable of making really tasty bread in just 1 hour. For a $60 machine, we didn’t have high expectations for it but were pleased that it worked well. Besides, we’ve owned other kitchen appliances from Oster before and they’ve all lasted for years, so we think that this machine is a great purchase. The only thing we’d like to comment on is the kneading blade. We thought that we would have achieved even better results if this unit had dual kneading blades. But considering the price and how our bread turned out, we were willing to compromise. If you want to make specialty breads and other items, this machine can also handle those. In fact, it has an audible feature that tells you when you should be adding nuts and fruits during the baking cycles. The recipe book that comes with the machine also teaches you how to make awesome recipes. For the price, it is an extremely well-built machine. It runs quiet and doesn’t rattle around on the kitchen counter. After using it for a few months, we think this is best affordable bread machine there is. If you don’t care too much about the appearance or having a perfectly kneaded baked bread, just get this machine. It will be more than satisfactory for most families who just simply want fresh bread. It is surprisingly easy to use too. Given the price, we’d even recommend giving it as a present. Most bread machines can be costly so it might not always be a good gift idea. But you can definitely give this as a gift and it would probably be a really cool thing to receive too. The Oster CKSTBRTW20 is a quiet machine that will handle an assortment of breads. Oster machines also tend to be very reliable. Affordably priced, it makes a great gift idea. 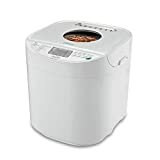 Has 12 pre-programmed settings: basic bread, French bread, whole wheat bread, 1.5-pound Ultra Fast, 2-pound Ultra Fast, etc. What can we say? The Oster CKSTBRTW20 performs well and costs about 60 bucks, making it the best affordable bread machine on the market. Whether it’s for your kitchen or if you plan to purchase this as a gift for someone, you’re going to be pleased with it. What is the main difference of the ckstbr20 and the ckstbr20 express?